Reserve Bears and Beyond Today! Really nice cabin, was cozy but wasn't real crazy with the layout. We also thought it was kinda weird that some of the previous cabins we stayed in had all premium channels and this one didn't, but we got by with what we had. The locations was great! I will definitely recommend this cabin to friends and family . The beds were comfy . I had a really relaxing time . Also , the cabin i not far at all from attractions . The Family dollar down the street came in handy for little things that we forgot . I will be using Cabin USA again in the near future . The only issue I had was upon arrival we didn't have the password to the Wifi but one phone call to Cabins Usa fixed that issue promptly . The cabin was in a great location! I already recommended to a friend, but the cabin is booked already! Maybe they can get it next year. The cabin is located in a great area, however there is a property across the street that has 3-4 very large dogs and they do bark, if that would be an issue for anyone that should be considered. We were on the go most of the time so this was not an issue for us. We did call maintenance for a couple things that needed fixed in the cabin and they came out right away, very impressive. I would suggest to the owner, that you leave some cleaning supplies, broom dust pan and maybe some bathroom cleaner. You will need to bring extra dish soap and cubes for the dishwasher only a small amount was left (only for 3 days). We did purchase a toaster and leave at the unit as the one there was broken. I would rent again from Cabins USA and this cabin was great! Great location and great cabin. Enjoyed our stay. There are a couple of issues. The drive-way is horrible for coming and going. We had to back out and turn around in the neighbor's drive-way every time. There is a hole in the East gable. During our stay a squirrel or some other animal decided to make its home in that part of the house and would make a horrible noise early in the morning waking up most of us. Other than those two problems, we would recommend the cabin and would even consider returning in the future. We had a very nice stay. Only thing was we seen some huge bugs in the bathrooms. Also our key code didn’t work when we got there and we had to call and get a new one. The hot tub had a musky smell to it. The sharp right turn to get to the cabin was hard to make and we were constantly having to back up in the middle of the road to make it. The staff was very nice when we called about our key code not working. We have recommended it to people already. The deck, and outside furniture need to be treated as they are getting faded and splintery. The pictures used to advertise the cabin need to be updated. The water smelled fishy. I wouldn’t consider the cabin as being “close” to Dollywood. The hot tub is leaking onto the lower deck. However, it is a very quiet and relaxing place that I would have loved to stayed at for a longer time had it been possible. It was clean and overall a nice place! We needed maintenance for the A/C, and the person showed up promptly and was very nice and respectful. We had originally booked another cabin for our 9 day trip to Gatlinburg, however it sold about a month before our trip. This resulted in us being moved to another cabin. At the time, Bears and Beyond was new to Cabins USA and didn't have photos. It was a little scary booking it, but it was the only cabin left with similar amenities so we went with it... Boy am I GLAD we did!!! My phones GPS took us some insane back road to get to the cabin on our first day, and I was initially a bit annoyed thinking that it was super far out. It actually ended up being in the perfect location. 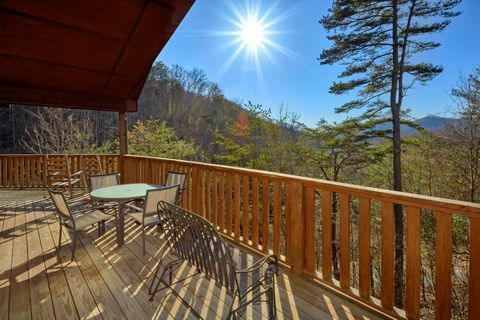 If you're looking to explore Gatlinburg, Pigeon Forge, and Sevierville, this is the house for you! It is literally in the middle of all three places! We took back roads during our whole trip which avoided that crazy stop and go traffic, and gave us a chance to check out the scenery. Oh, and there is a Family Dollar right down the street so you can grab things that you forgot! Now lets talk about the cabin and the pros. The road to get to the cabin does wind and it is steep in places, but not nearly as bad as some (like a lot of the roads between PF and G'burg). It's totally manageable in a 2WD as long as there isn't snow/ice. The cabin itself is beautiful and the pictures are extremely accurate. You walk into the kitchen and living room combo. The kitchen has all of the normal things, and a dishwasher which is a plus! The living room has a recliner sofa and a rocking chair. It also has a fireplace, however we couldn't get it to work. I decided maybe it was turned off since it was the end of March and we didn't miss it! Off the living room is the master bedroom with a king sized bed and an in room Jacuzzi. Attached is the master bath with laundry and a huge walk in shower with two shower heads. Off the master is also the deck with the hot tub. The hot tub was glorious after a full day of walking and exploring and it was a perfect location to relax after putting our toddler to bed. AND since the deck has a roof, we were able to relax even while it was raining/storming. Downstairs is a large room with a pull out sofa and a pool table. Off that room is the lower deck, which is not accessible to the road, so it was perfect to let our daughter play on while we played pool. There is also a second bedroom downstairs. I cannot speak for the bed because we rented a crib for our daughter, but it seemed nice. There is also a small bathroom with a tub/shower combo. The pool table is not level. No big deal, in my opinion, unless you're a professional I guess. It's not hugely off, but enough to make some balls miss a pocket when they really should have gone in. The master bath shower needs a good scrubbing floor to ceiling. There was some mold. The kitchen is lacking a few things. Unfortunately I didn't notice there wasn't a strainer until I had a pot of noodles ready to drain. OOPS! There weren't any pot holders or dish towels either, which made getting casseroles out of the oven a bit dicey. There is no baby gate for the top of the stairs! That's a big one for families. It's a large opening so a standard gate isn't wide enough (we bought one at Walmart and had to return it). I hope the cabin owners may think about having one built in. Thankfully our 2-year-old listens well, but a baby who is crawling could be an issue. There is a mouse issue. I called after we had been there a few days, after discovering mouse poo on the counter and that our loaf of bread had been invaded. You can hear them in the ceiling when you're downstairs. I made sure to let Cabins USA know that I wasn't complaining. After all, these cabins are rural and critters happen! I'm sure they'll have an exterminator come out.